Long range precision is a demanding sport that requires the perfect blend of rigorous training and quality ammunition in order to reach your full potential. 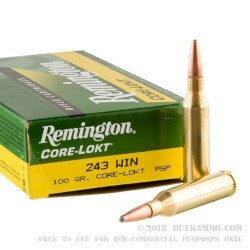 This Remington 100 grain .243 pointed soft point ammo was engineered to take your accuracy to the next level, and do so with an authority that will have you shooting nothing else on the market today. 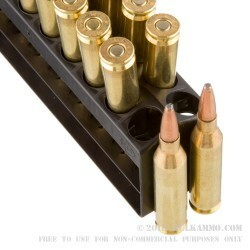 Utilizing Remington's patented Core-Lokt bullet technology, the Remington 100 gr. .243 Pointed Soft Point was designed with a Spitzer shaped bullet profile to maximize bullet performance in terms of increased velocities and overall flatter bullet trajectories. 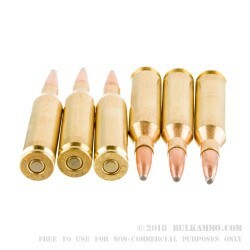 The pointed soft point tip of the bullet’s face is instrumental in the rounds expansion upon impact with the tragert, and results in a expansion over twice the diameter of the bullet’s original diameter upon impact. Remington reports their 100 grain .243 Pointed Soft Point travels at an average muzzle velocity of 2,960 feet per second and is capable of supersonic flight out to nearly 700 yards. For hunters who are often engaged in extreme long distance shooting scenarios, the importance of having ammunition that can stay supersonic out to great distances cannot be understated in mitigating the impact of environmental elements such a wind on the bullets intended path. Hunters looking to take their hunting preparation to an unmatched level of excellence will not go wrong in utilizing this Core-Lokt ammo in their next outdoor expedition.